I'm not much for British saws, but every once and a while, you see one that you can't live without. Such is the case with this rip that was made by the Sheffield firm of Webster & Johnsong. This massive 26" rip saw has to be seen to be truly appreciated. A full 8" high at the heel, and 3" at the toe, this saw has 3 1/2 ppi rip teeth which get gradually finer as you go toward the toe, ending up at 4 ppi. I do not know much about this firm, but I estimate the saw from about 1820 based on the handle style, and other markings. The handle on this saw is made of English Beech with four early split nut type brass screws. If you examine the handle closely, you will soon see that it is very different from others that you have seen on this site. First off, the bottom of the handle is flat. This a characteristic of the London Pattern, as it is called. Saws like this are generally very early. Another thing you might notice is that the handle is nearly perpendicular to the axis of the blade. 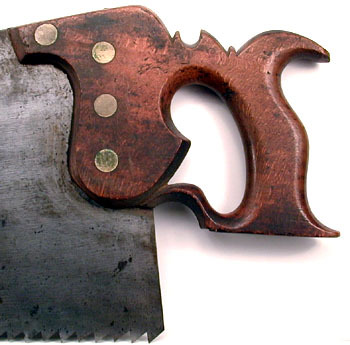 This is another characteristic of early saws. Finally, you will see several embellishments on the top of the handle, and then a steep rise. This is known as a drop front handle for obvious reasons. If you were to take the handle off, you would see the the steel ends at a right angle under the drop off. It wasn't until much later did the plate under saws get relieved to allow the handle to come up closer to the blade. Henry Disston's D8 was the first saw to use this feature which was known as a let in handle. Finally, the blade is hand stamped with the firm who made the saw. In addition, you will see three crowns around the maker information. This is a trait of very early British Saws. While I don't know the significance exactly, it has to do with licensing by the crown.